Fall is my favorite season of all, and although I love Summer as well, it literally passed in the blink of an eye this year. 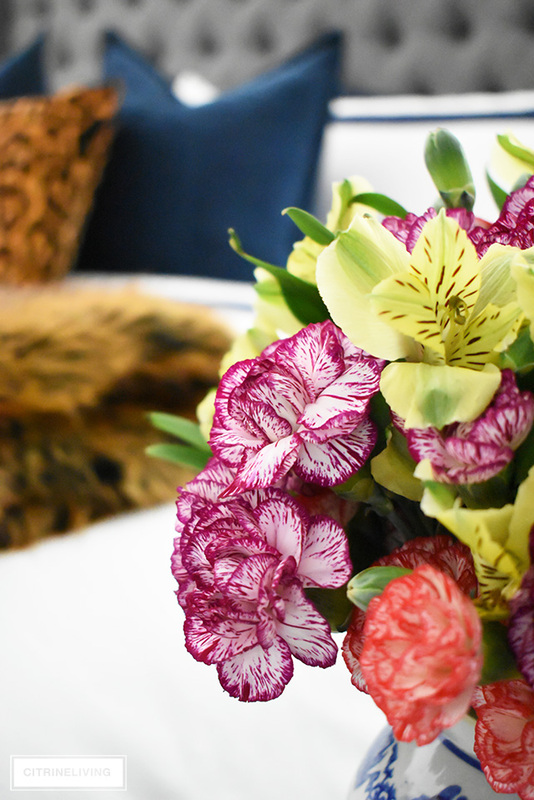 The cooler temperatures we’ve gotten earlier than normal have me longing to wear blazers and boots, and dress our home in rich autumnal hues. 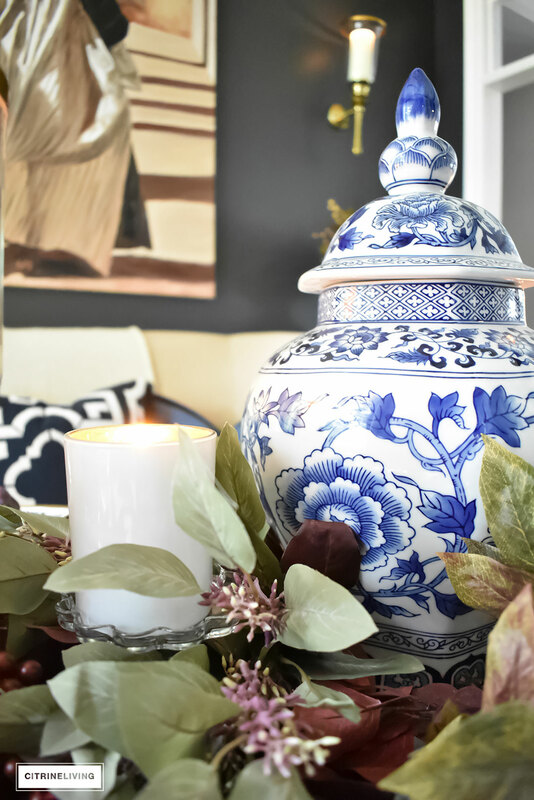 It seems like September came out of nowhere and I don’t know about you, but this Fall season I’ve decided to forego using pumpkins and gourds throughout our home. 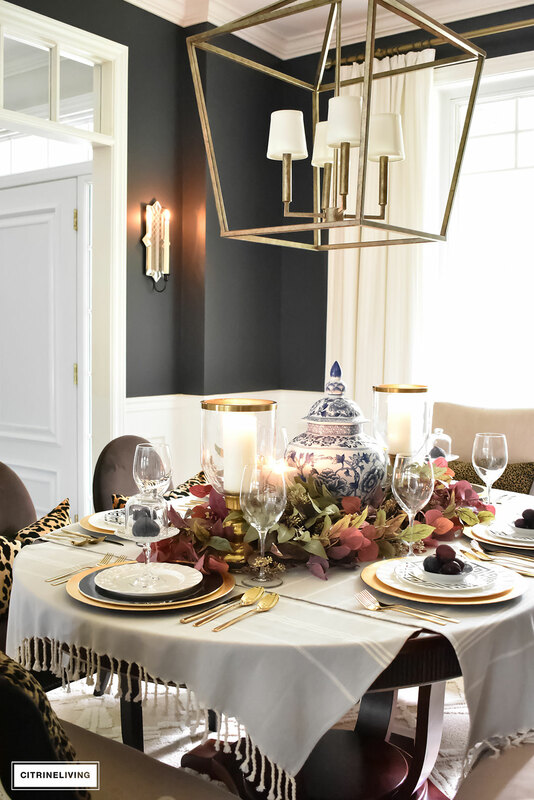 I usually keep the Fall decor simple (I may still sprinkle a few here or there) and this year I wanted to explore decorating for the season in other ways, by bringing in luxurious fabrics, animal prints, metallics, and deep colors and textures. Today, I’m sharing my first post of the Fall season along with a fantastic group of bloggers who will all be sharing their take on season with you as well – the lineup is listed at the bottom of my post! 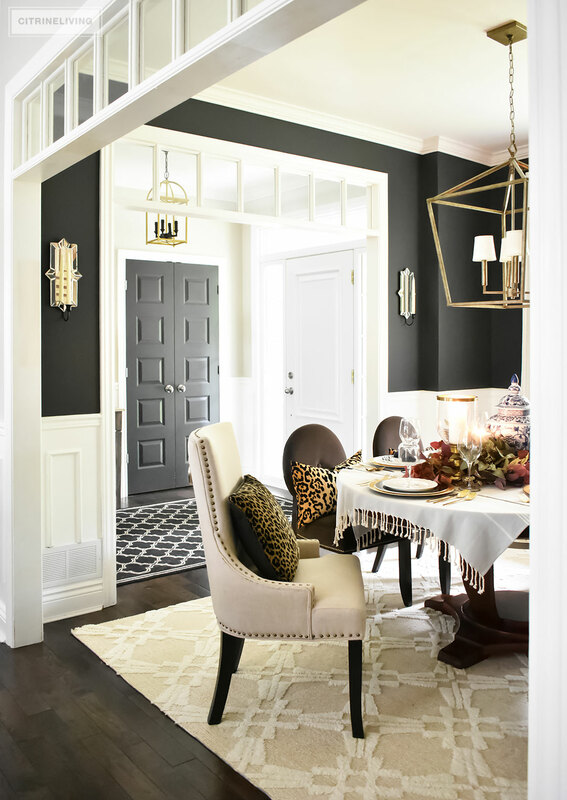 If you’re joining me today from the very talented Jodie and Julie of The DesignTwins – welcome to CitrineLiving! How gorgeous is everything they do?! I’m so happy to have you visit our home today, and I’d love for you to stay a while! 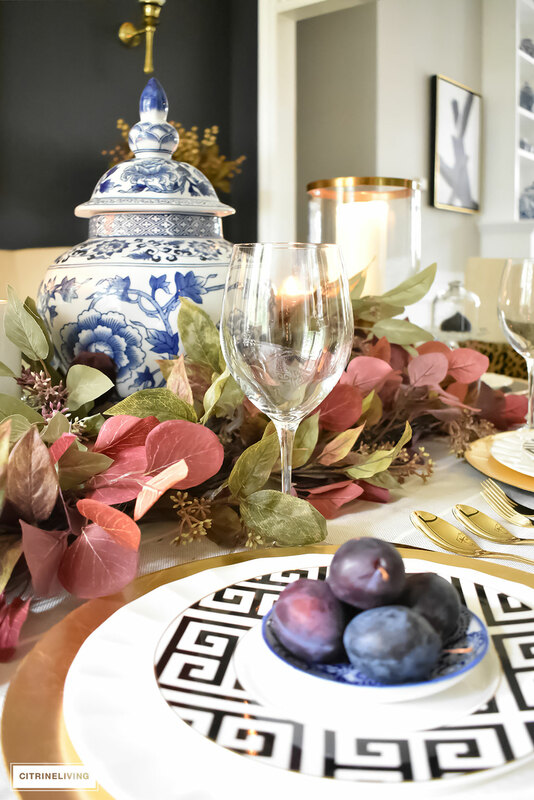 I am sharing a simple and elegant Fall tablescape – sans pumpkins – layered with faux foliage, metallics, black and white, and a little bit of chinoiserie thrown into the mix. Have a look and let me know what you think in the comments below! 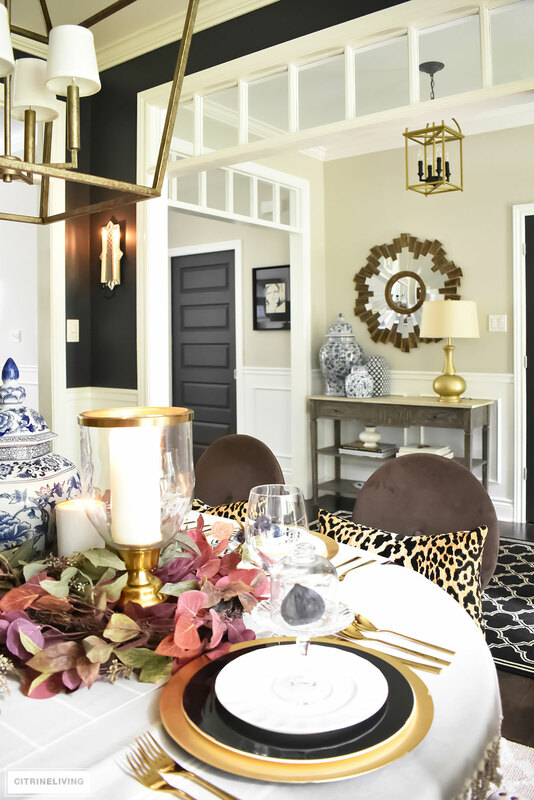 Here’s a look into our dining room from the foyer as you enter our home – I’ll be sharing more of this space later this month in my full Fall Home Tour, on September 21st, so don’t forget to check back to see the rest of our home decked out for the season! 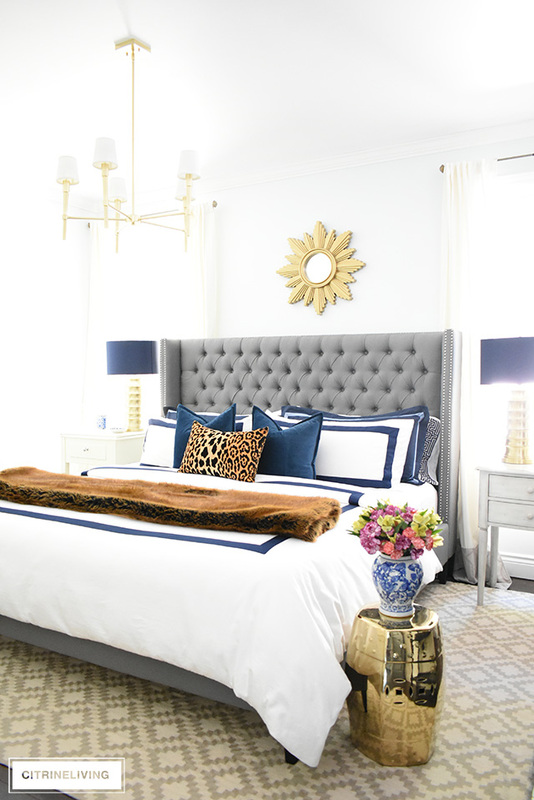 Animal prints have always been one of my favorite patterns – I had a plethora of leopard pillows in our first apartment (I have a couple of them here on the beige chairs!) eons ago, and when it comes to Fall fashion, nothing brings it on like a fabulous leopard shoe and handbag. I wanted to bring the same feeling into our home this season. 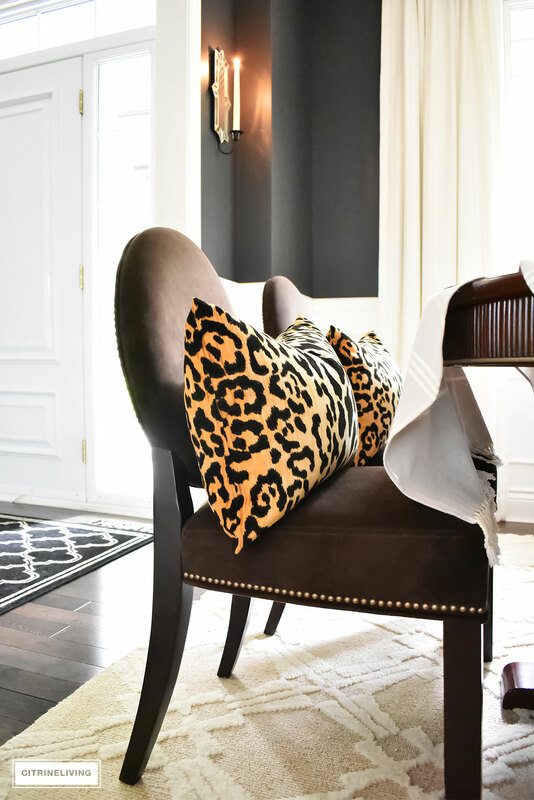 I found these gorgeous leopard print pillows from Tonic Living and I have to say, I’m just smitten with them…so much, that I may be using them as a recurring theme throughout our home for the season. To see these beauties Click here. 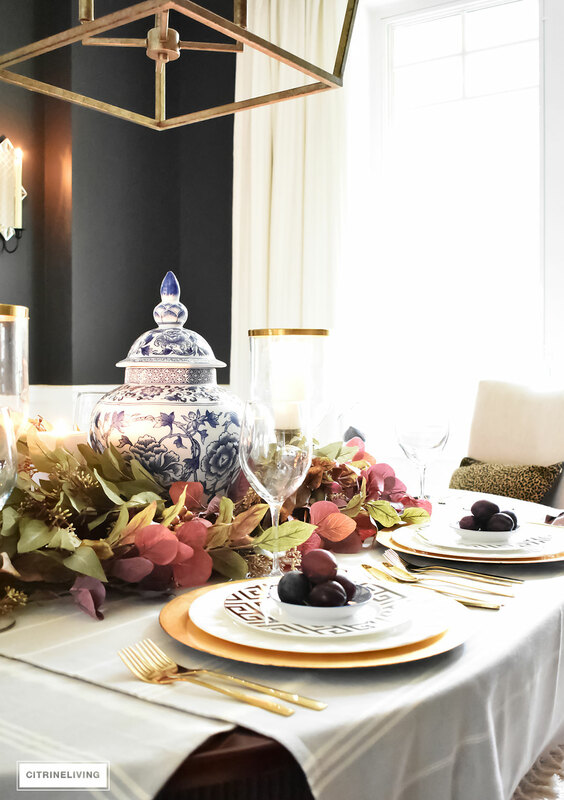 I wanted to keep the table simple with a focus on rich, deep hues. 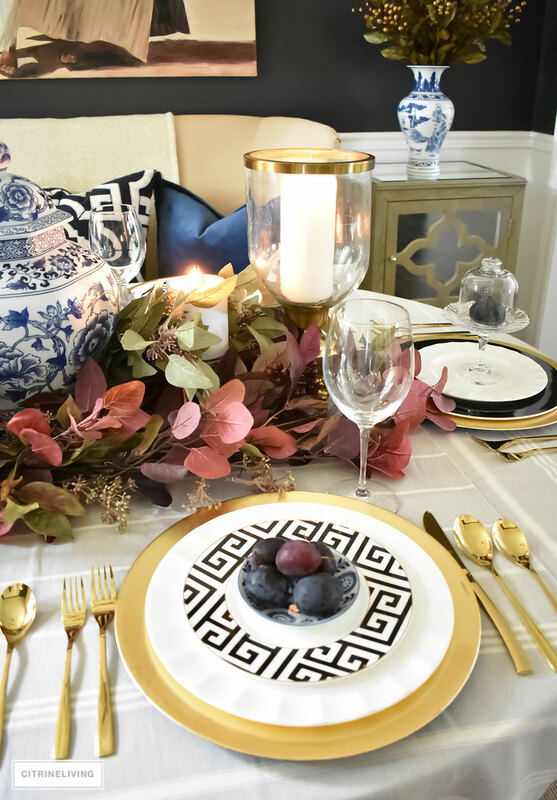 The layers of deep burgundy and purple, blue, green, gold and black are a sophisticated nod to the Fall season. 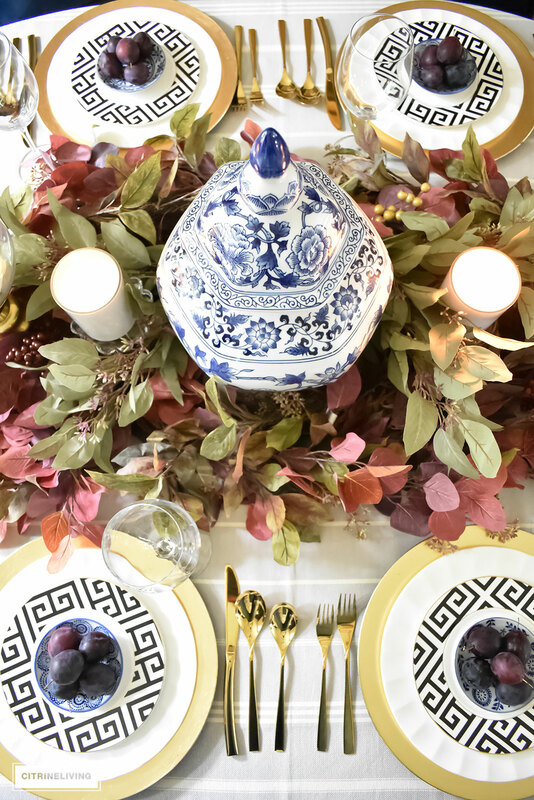 There are a few reasons I decided to forego the pumpkins and gourds this year…First of all, I wanted to come up with something that was timeless and that could be used for any Holiday festivity – this table could work for Christmas just as easily as Thanksgiving or Rosh Hashana – you don’t have to adorn your holiday tablescape with what you think you have to. 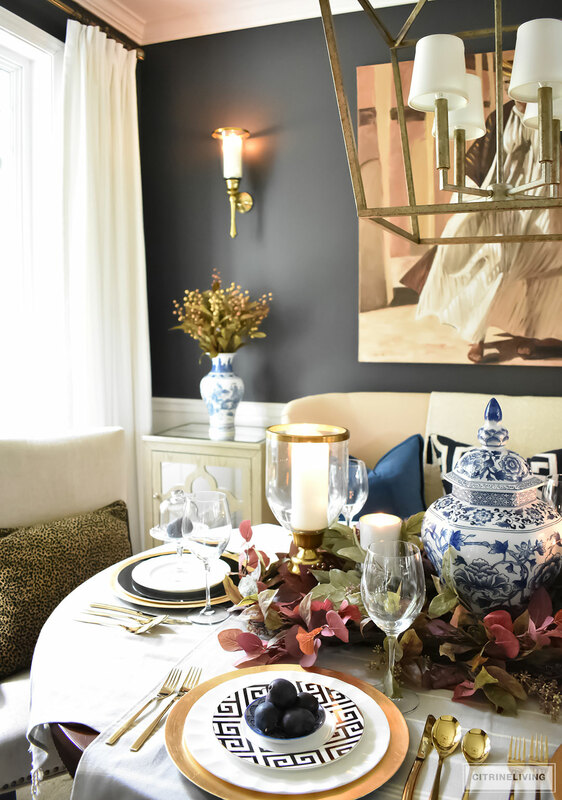 Second, I wanted to keep it simple, classic and elegant – I pulled together deep colors, pattern mixing, and textures that spoke to me this season to create this look without using pumpkins and such. 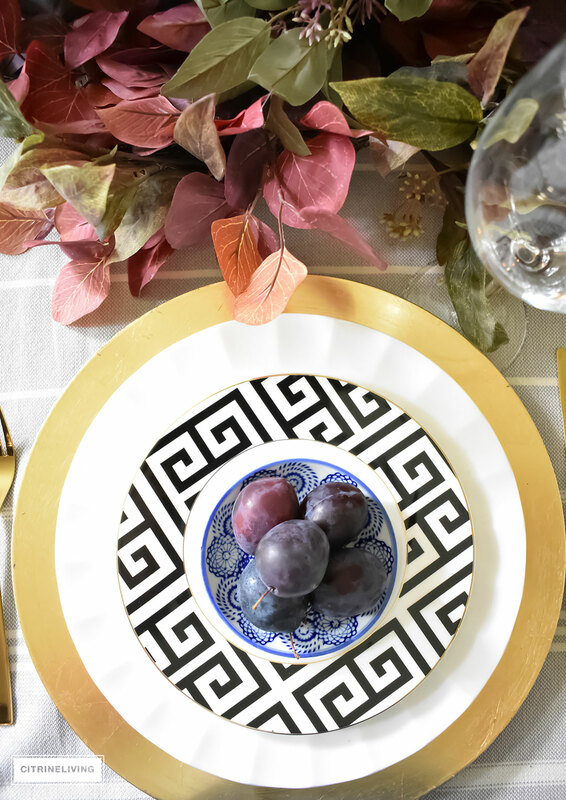 Adding unexpected greek key plates in black and white brings a glamorous edge to the table, and I really love how the linear pattern mixes with the blue and white chinoiserie. 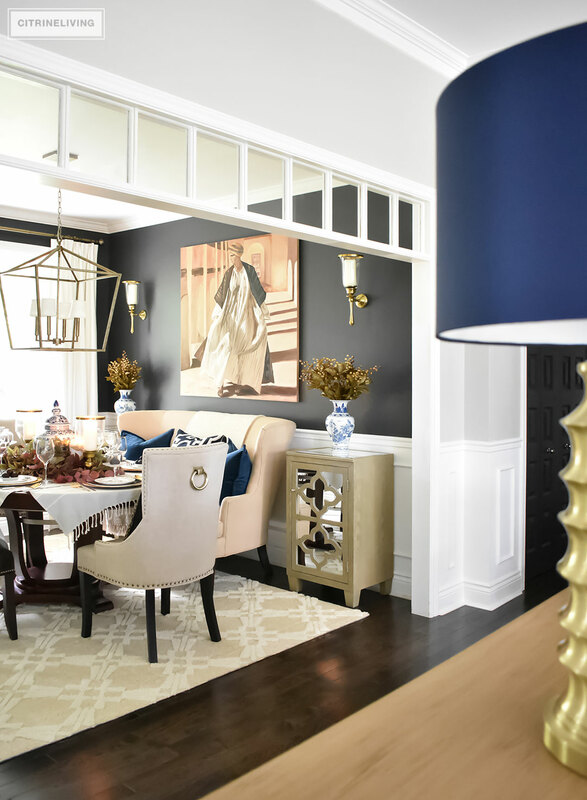 In case you haven’t noticed already, these gorgeous brass wall sconces are also new! 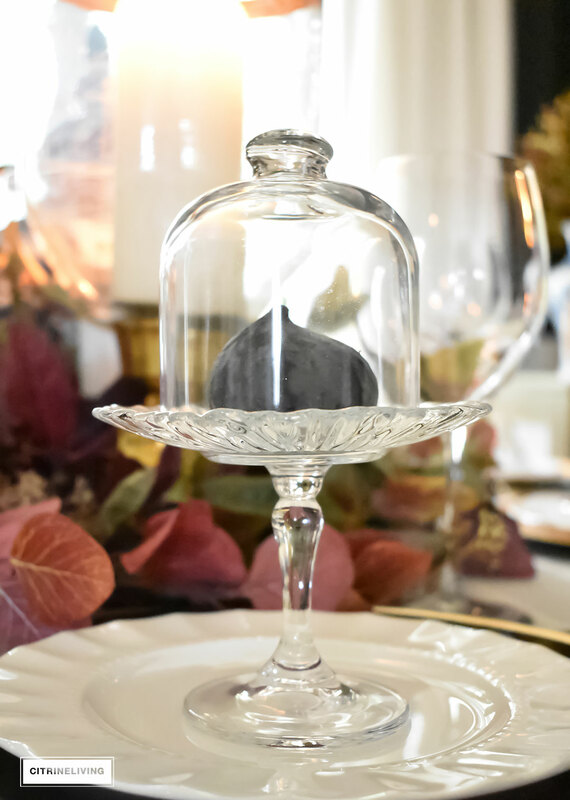 They’re from Lux Decor and they’re the perfect addition to our dining room. 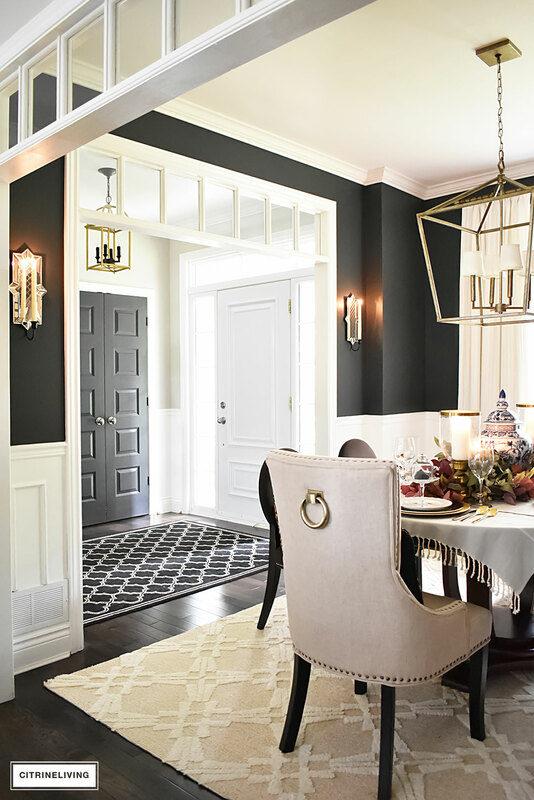 I’ve been looking for brass sconces for a while now, and these are just beautiful. 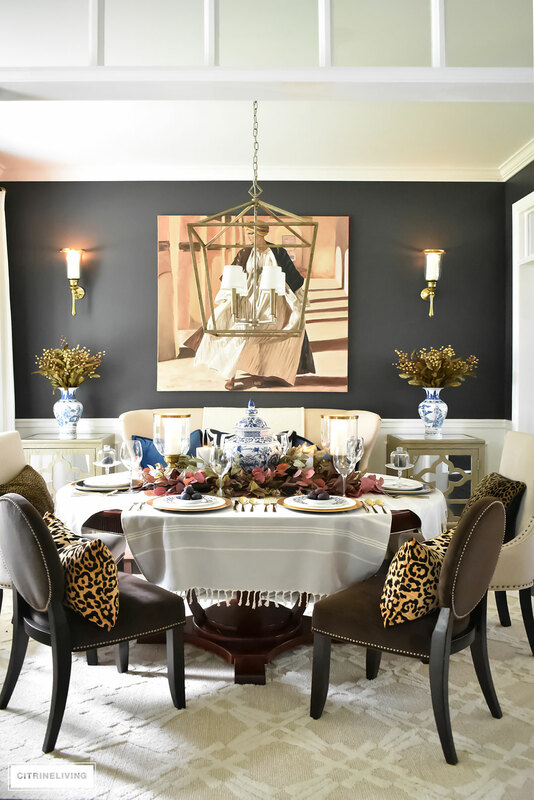 The scale and elegant lines flank my mother’s painting perfectly, they really finish off our dining room just as I had envisioned. 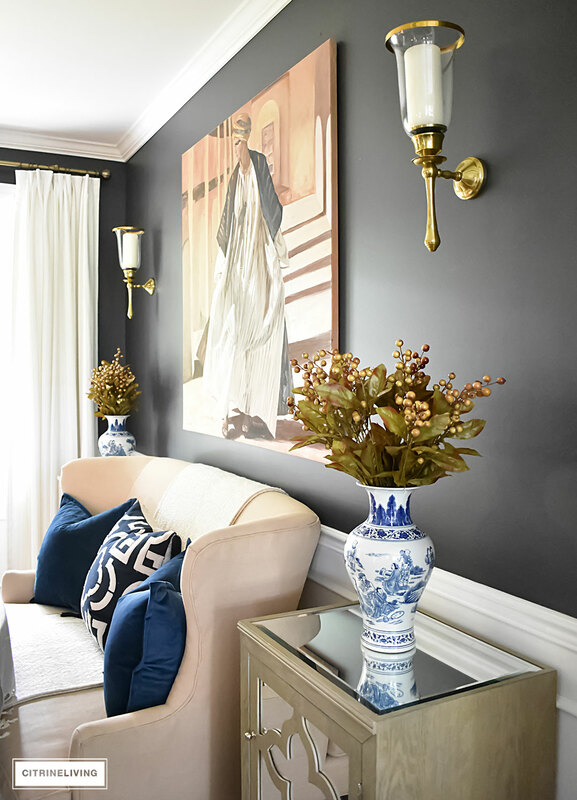 The brass against the black wall color (Cracked Pepper by Behr) is rich and elegant and I love it. 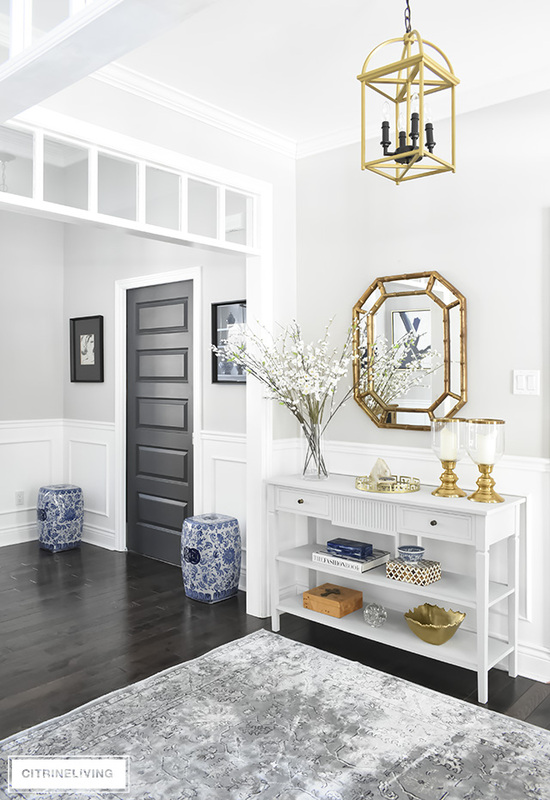 I moved the mirrored sconces back to the opposite wall, where they were previously – they’re a much better fit, scale wise. 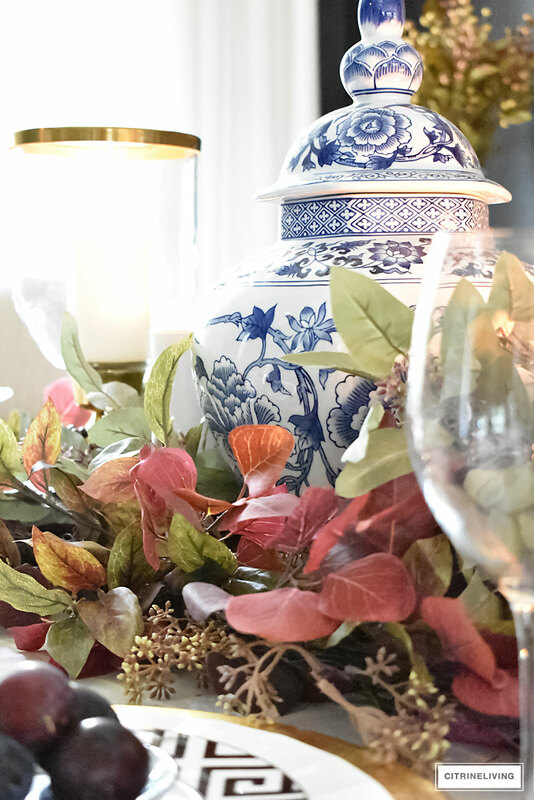 Back to the table, I created the centerpiece with layers of faux foliage – two garlands and four floral stems. 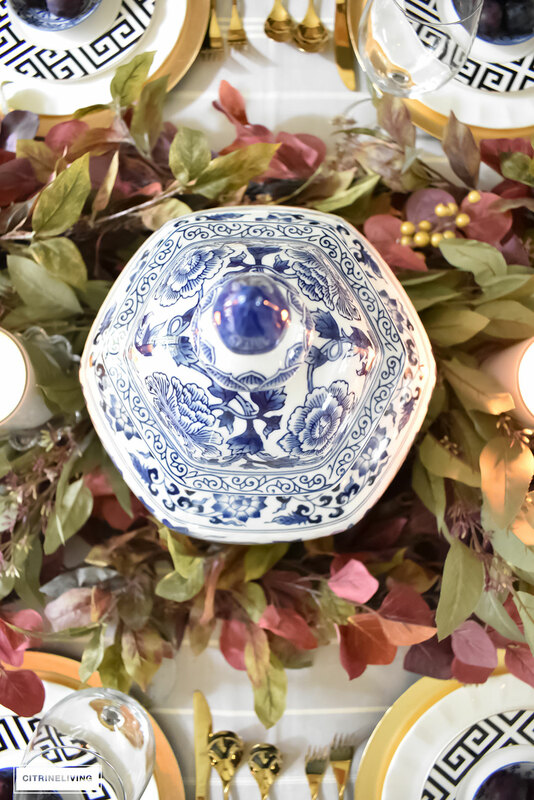 I wrapped both garlands around the brass hurricane lanterns (also a new find this year from HomeSense) to create a continuous oval shape around them (think of a race track), and then filled in all of the open spaces with 2 of each type of stem. I found everything from Michael’s on sale 2 for 1. I always make sure to pick up extra – you always need more than you think, and you still end up going back for more! I really love the muted reds, purples, and burgundy tones mixed with the greens. I just may be using some of these again this coming Christmas – they can last all season. 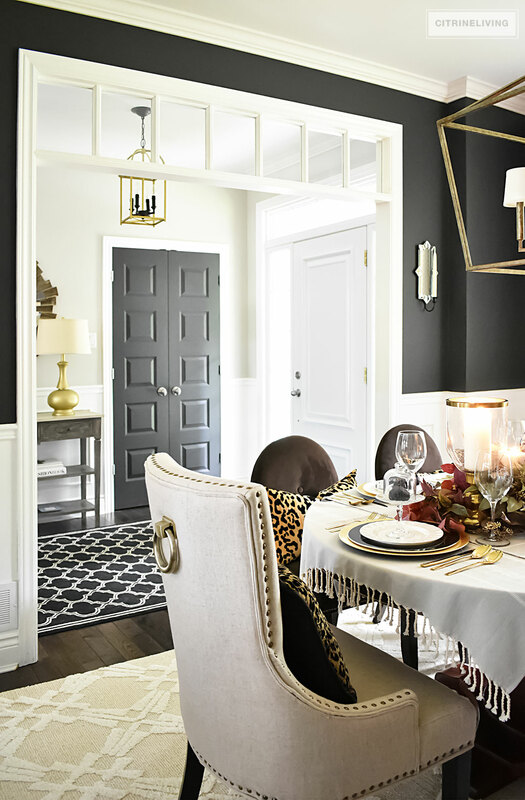 I used gold flatware and chargers to echo the brass hurricanes and wall sconces. I love to mix metals, and I do quite often, but for this table, I kept the metals all the same. 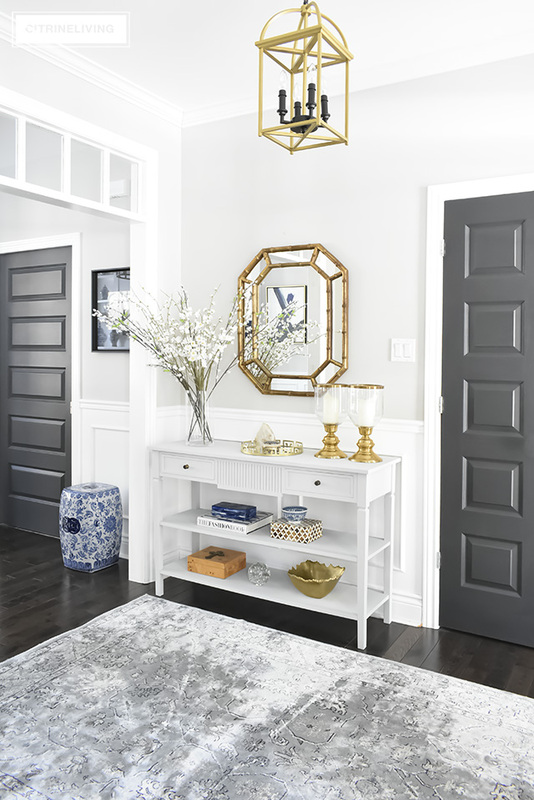 Here’s a little peek into our entryway – I haven’t quite decided how I’m styling our console for Fall just yet, but I do know I’ll be keeping my blue and white pieces with this lamp I stole from our daughter’s bedroom, and spray painted gold (it needs a new shade!). We just painted her bedroom and updated her lighting. You can read all about it here. 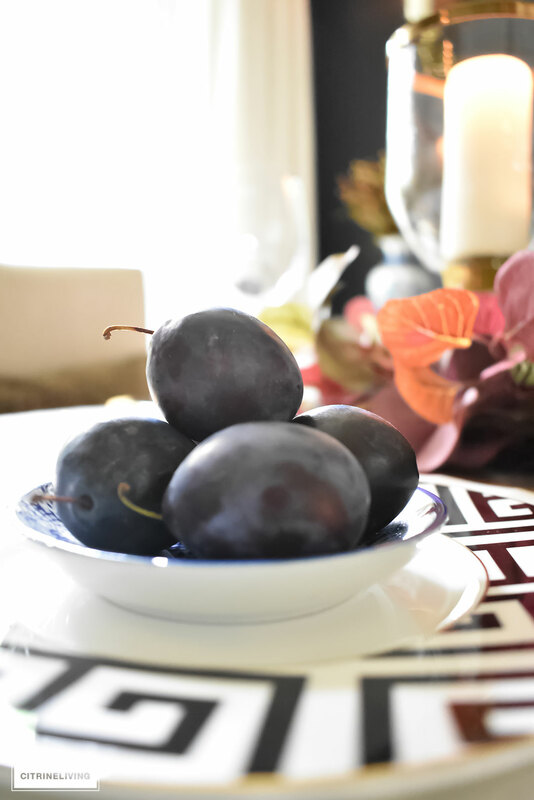 Fresh plums are a beautiful addition to any Fall table, I just can’t get enough of the gorgeous colors against the centerpiece and blue and white. If you remember my Summer Home tour (see it here), you’ll recognize these two striped throws covering our table – I decided to keep them because I really love the color and I love the casual vibe they bring to the space. I have plans to eventually replace this table or paint it, and I have my heart set on a light taupe/grey color. The fringe is a fun detail also and keeps the feeling in here laid back. I used figs again this year, and I would say I’ll probably be using more of them along with more plums in the kitchen also. It’s so easy to add touches of the season with fresh produce. 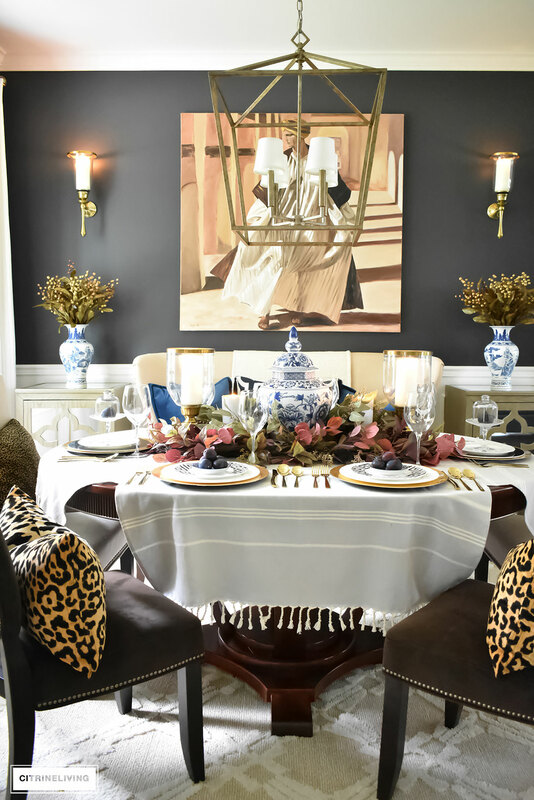 You can see how I used figs in my Fall tour from last year, here. 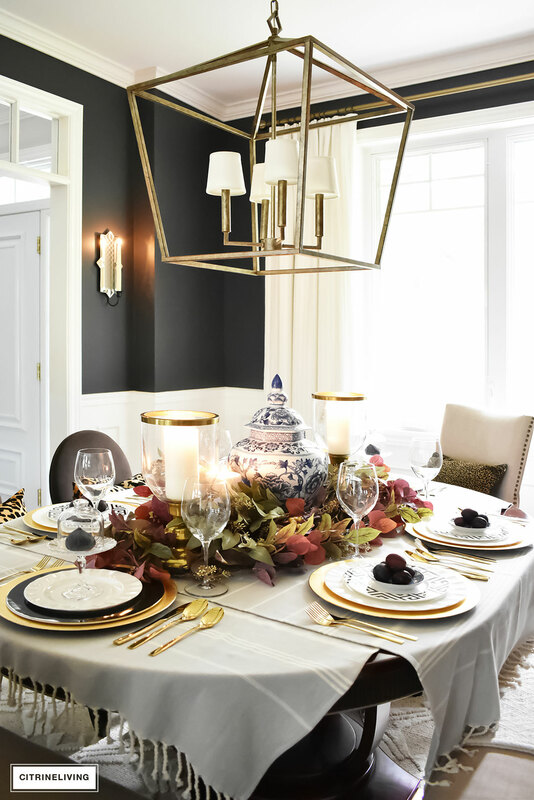 When you think of all of the colors I pulled together for this table, it sounds like too many when you’re reading it – but notice how well they all work together. The key is to balance them out and not to use too many of each…keep some dominant and others secondary, when you’re using a wide range in your palette. 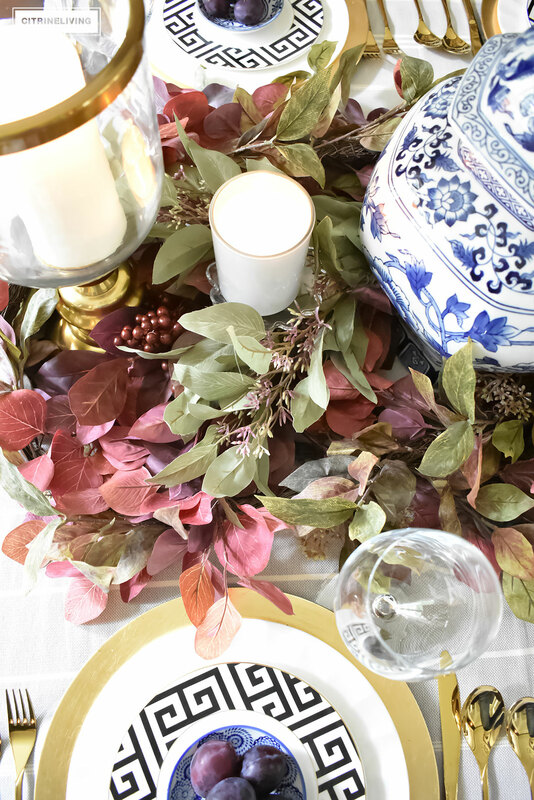 I’m so happy to share this tablescape with you today, and as I mentioned earlier, it’s simple enough to use for any of the upcoming holiday gatherings. I hope you found some inspiration! Thank you for taking the time to read, I hope you enjoyed it too. 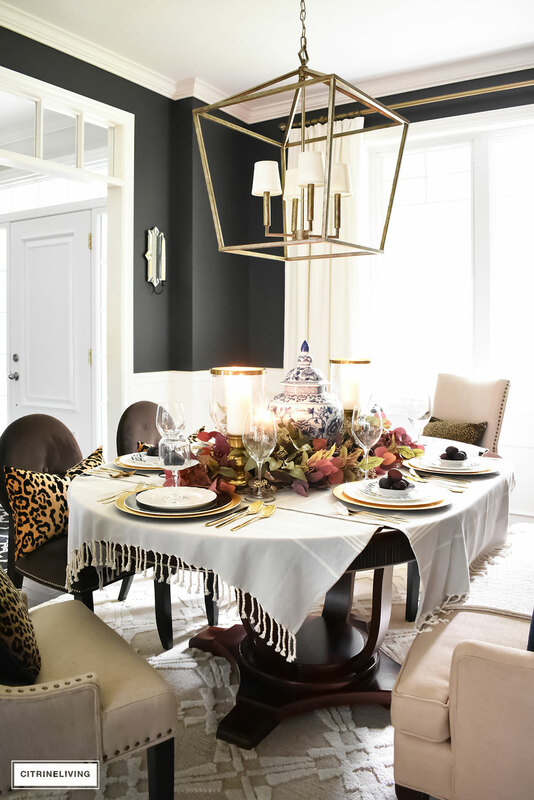 Next in our fabulous lineup is Kathleen from Lindsay Hill Interiors – you will love Kathleen’s gorgeous Fall touches, she never disappoints! 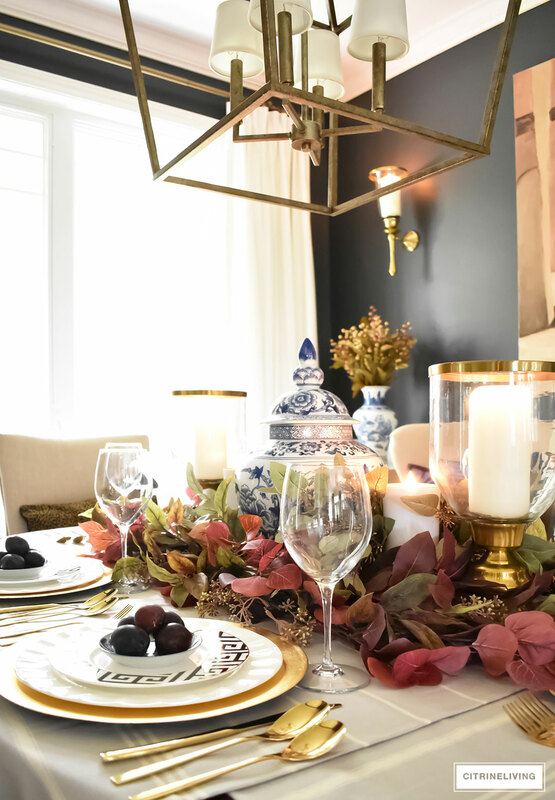 To get more Fall inspiration, you’ll want to be sure visit all of the fabulous bloggers on the tour today, listed below! 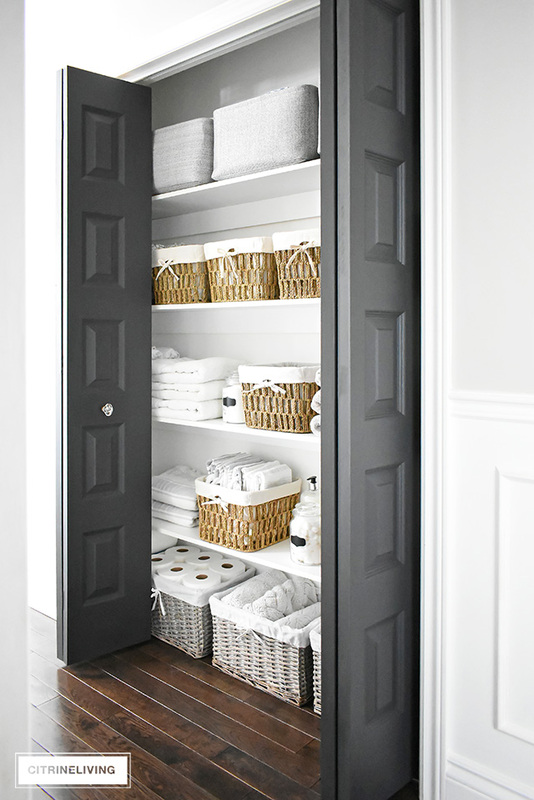 *I’d like to thank both Tonic Living and Lux Decor for providing product for this post – all reviews and words are my own. I love your style! I especially love the blue incorporated! The painting is so cool- can I get that somewhere? Your room is lovely. 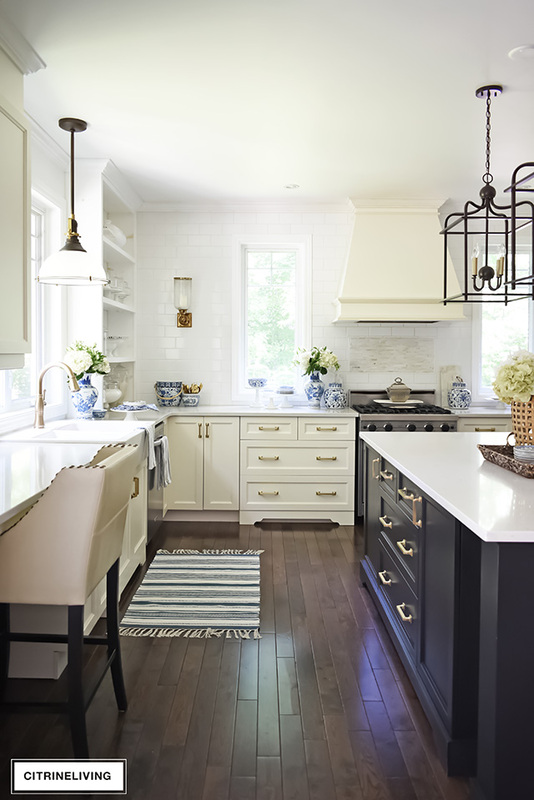 Blue and white go with anything, I use it all the time in my décor too. May I ask what are the dimensions of your dining room? 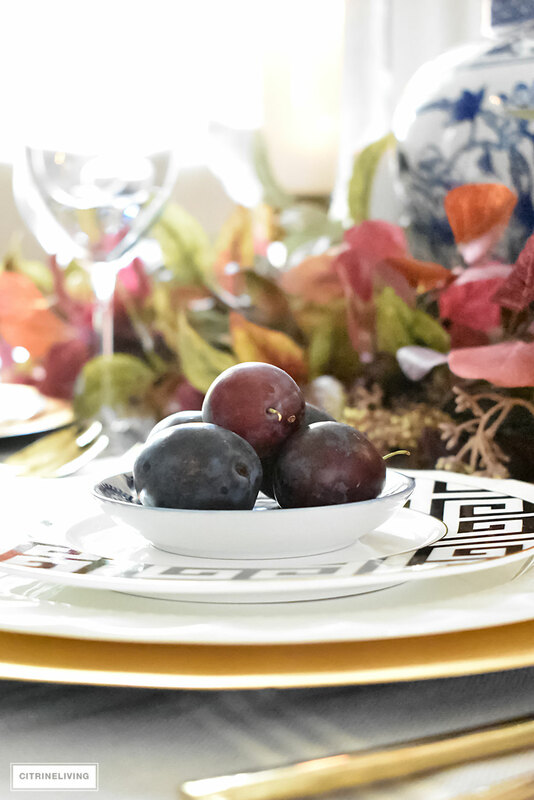 This is such a sophisticated and beautiful fall table! 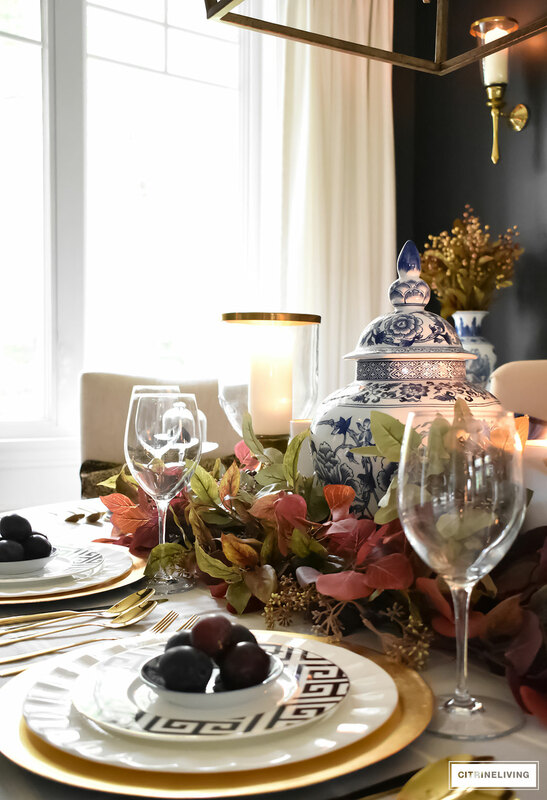 I love that you skipped the traditional pumpkins and used plums and foliage instead! Also, the ginger jars and leopard print pillows will always be favorites of mine! So elegant–thanks for sharing. Thank you Elizabeth! 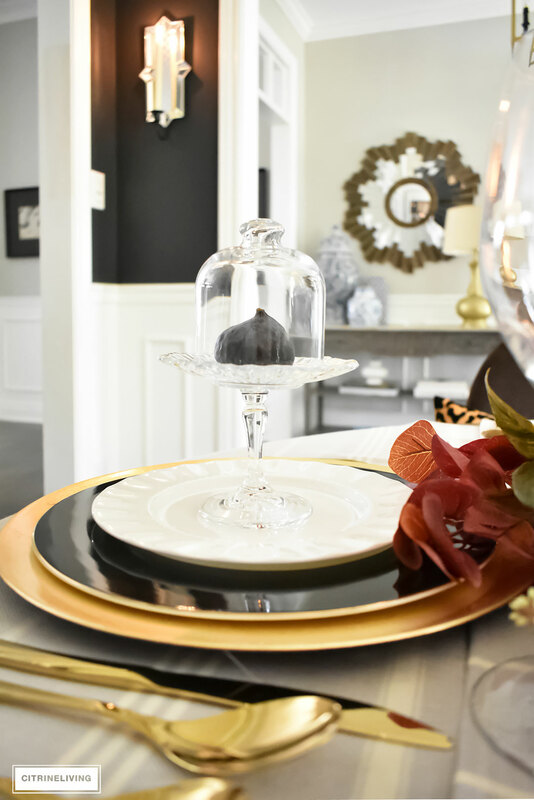 I am so happy you like it – I wanted something a little different this season! So happy you like the blue and white and leopard too!